We are delighted to present the 2018 summer exhibition at the Island Inn: Joan Harlow: Island Life. To view the paintings, please click here. Since 1967, when Joan first came to Monhegan Island to stay with her great aunt Alice Kent Stoddard, a portrait artist from Philadelphia, she has not missed a year on the island. The oil paintings in the exhibit represent over two decades of painting on Monhegan, and portray– through still life, quiet glimpses through curtained windows, and spontaneous moments in village life– a personal view of island life. Joan is a member of the Copley Society in Boston, the New Hampshire Art Association and the Seacoast Art Association. The season-long exhibit will run from Friday, May 25 to Sunday, October 7. Please join us at the Island Inn for a reception for the artist, on Wednesday afternoon, June 27, from 2-4 pm. The Lupine Gallery and the Island Inn will be showcasing Stan Moeller’s paintings of Monhegan Island and Paris, France in the 2017 Island Inn Show, “Stan Moeller: from Montmartre to Monhegan.” The exhibit will be on view from Friday, May 26 through Sunday, October 8. The public is invited to a reception for the artist at the Island Inn on Wednesday, June 28 from 2-4 pm. Stan Moeller has been painting and teaching oil painting workshops on Monhegan since the 1990’s. He describes his style as “Modern Impressionism with a little Contemporary Realism and a smidge of the Ashcan school.” The works on display reflect his passion for painting on site and his ability to capture the energy of a moment—whether the power of an ocean wave or the gesture of a figure in a café. There has been a strong thread of connection between Monhegan and Paris for over 100 years, as American artists who were drawn here to paint the rugged and rustic life of the island were also drawn to the Paris art scene. In the late 19th and early 20th century, the hill of Montmartre was a mecca for painters, and many of Monhegan’s most prominent artists lived and studied in Paris, bringing the latest movements in European art back with them. Stan travels annually between Maine and Europe to paint two of his favorite muses: Monhegan and Paris. This show brings together, for the first time, his paintings of these two iconic places. The owners of the Island Inn, Jaye Morency and Michael Brassard, split their time between Monhegan and Paris each year, and were inspired to bring their love of their two favorite places together in this exhibition. Lupine Gallery and the Island Inn are pleased to present the exhibition of paintings, “Don Stone: A Monhegan Legacy.” The exhibition will run from May 27—October 9, 2016 at the Island Inn, with an opening reception on June 22 from 2:30 to 4:30 pm. The exhibit features masterworks by esteemed artist Don Stone, NA, (1929-2015), and is complemented by paintings by seventeen fellow Monhegan artists who were influenced by and painted with Don Stone over the years. Don Stone, a full member of the National Academy and an internationally recognized marine and landscape painter, lived and painted on Monhegan for over 40 years. Originally from Gloucester MA and a long time resident of Rockport MA and Monhegan, Stone’s work reflects his lifelong involvement with the sea, the coast, and fishermen’s wharves. Beginning in the early 1970s, Stone reinvigorated the tradition of plein aire painting on Monhegan, and as both a painter and teacher, had a profound influence on the art community. Long considered the dean of Monhegan painters, he taught workshops for three decades on the island and mentored many contemporary artists, some of whom are included in this show. Frank Bruckmann studied at the Ducret School of Art in New Jersey, the Art Students League in New York, and the Ecole des Beaux Arts in Paris. A resident of New Haven, CT, Frank has been painting on Monhegan for over 20 years, capturing the landscape and atmosphere of the island in all seasons and all its variations. The season-long exhibit will run from Friday, May 22 to Sunday, October 11. Please join us for a gala reception for the artist, at the Island Inn, on Tuesday afternoon, July 7, from 2-4. We are pleased to present the 2014 summer solo exhibition at the Island Inn: Selected Oils and Watercolors by Ralph V. Bush. A Copley Master and member of The New England Watercolor Society, Rockport Art Association and North Shore Arts Association, Ralph is a well-known figure on Monhegan, where he has painted the island vistas and harbor scenes annually for many years. The paintings will fill the Inn’s large, light-filled dining room, and will be on view May 26—July 26 and August 11—October 13. The Island Inn will host a reception for the artist on Wednesday, June 25 at 2-4 pm; all are welcome. Recently, I was invited to take a little field trip to Cushing, Maine to the property of amazing sculptor, the late Bernard (Blackie) Langlais. The Langlais estate had been left to Colby College, which quickly found itself overwhelmed with hundreds of sculptures in need of restoration and conservation, not to mention permanent homes. Enter the Kohler Foundation. This is a philanthropic organization with a mission: they bring in restorers, repair and conserve the artwork, find it homes, and– give it away. Wouldn’t you love a job like that? Museums, colleges, libraries and other non-profits were invited to be the recipients of the artworks, and we were there to choose a piece of sculpture for the Monhegan Library. It was a trip to remember! If you’ve never visited the Langlais place, it’s a little hard to convey the uniqueness of the experience. There’s a definite sense that you’ve gone down the rabbit hole with Alice. Or Christina, as the case may be. As we followed paths that wound through over 80 acres of overgrown fields and forests, we glimpsed giant animals, people and totems hidden in the underbrush or towering in the open. The monumental scale of the sculptures was fabulous, and created a wonderful sense of play and delight. Was that an elephant in the distance? I remembered, back when I first visited the Langlais place as a teenager, being able to climb up inside the elephant. It isn’t in good enough condition today to go up– but we did duck inside the bottom and, sure enough–the paintings were still there, of bananas and nuts and all the foods our elephant had been eating. (for scale, check out Bruce’s legs underneath the sculpture). (Gerald Ford in the bath, anyone? ), the pieces that really stay with me are the animals. There are several barns and workshops on the property, and each one is a treasure trove of sculptures, from life-sized animal figures to whole tableaux of jungle or barnyard creatures in huge bas-relief panels. Most of the pieces were too large for our little island library, and all of the outdoor sculptures had already found homes. But in the end, we found a perfect fit in this charming little stable scene in a box! And a bonus: this butterfly wall sculpture! This project is a partnership between Colby College Museum of Art, the Kohler Foundation and the Georges River Land Trust. Colby is planning a major Langlais show in 2014. The land trust will take ownership of the property, along with several of the large sculptures, and will maintain it as a sculpture park. Thus, the land will be protected for conservation, and the legacy of a great Maine artist be preserved and shared. We were so glad to have been able to visit all these works together in the place where they were made, before they were dispersed to museums, schools and other locations all over the country. And very glad to be able bring a small piece of that heritage to our small corner of Maine. Lupine Gallery will be featuring the paintings of Sylvia Alberts from July 25 through August 12, 2013. Please join us Thursday, July 25 from 5-7 pm for an opening reception. 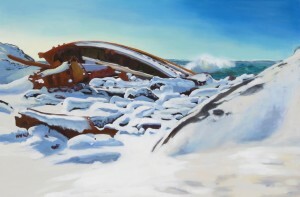 Shipwreck and Snow in a Northwest Gale. Oil, 24 x 36. $2200. We’re delighted to announce that the Island Inn will be featuring the paintings of Susan Gilbert this summer. In a tradition that began many years ago, the Inn has hosted an exhibition of the work of a different Monhegan artist each year. The invitational show fills the large, light-filled dining room and can be viewed for the entire 2013 season from May 24 to October 13. Susan Gilbert is a graduate of the School of the Museum of Fine Arts in Boston, and is also known for her work in fine porcelain ceramics. Susan has been a member of Monhegan’s year round community for many years. This show will feature oil paintings and watercolors, ranging from still life to landscapes painted on location and portraying the island in every season. Join us for a reception for the artist Wednesday, June 26 from 2-4 pm, at the Island Inn. We’re excited to present this summer’s solo exhibit at the Island Inn, by one of our favorite artists–Paul Niemiec. Paul has been painting on Monhegan for over 30 years now, and the lobby and dining room of the Inn are hung with a stunning collection of watercolors and oil paintings of the island in all its dramatic, varied, moody glory. You won’t want to miss this show!